Learn how to customize the Toolbar in Photoshop CC using the Customize Toolbar dialog box, and how to save your custom Toolbar layout as a preset. You'll learn how to remove and restore tools, group and ungroup tools, reorder the tools, change keyboard shortcuts, and more! So far in this series on the Photoshop interface, we've learned all about Photoshop's Toolbar and its many tools. We've also learned how to reset Photoshop's tools and the Toolbar back to the default settings. In this tutorial, we'll learn how to customize the Toolbar in Photoshop! In Photoshop CC, Adobe finally allows us to create custom Toolbar layouts that better match the way we work. We can hide tools we don't use, change the tool groupings, rearrange the order of the tools, and more! We can even save our custom Toolbar layouts as presets! Lets see how it works. To use the new customizable Toolbar feature, you'll need Photoshop CC. You'll also want to make sure that your copy of Photoshop CC is up to date. This is lesson 4 of 10 in our Learning The Photoshop Interface series. Let's get started! Photoshop’s interface showing the Toolbar (highlighted) along the left. Each icon in the Toolbar represents a different tool we can select. Yet as they say on late night infomercials, "But wait... there's more!". Most of the tools we see in the Toolbar have more tools hiding behind them in the same spot. To view the additional tools, right-click (Win) / Control-click (Mac) on a tool icon. A fly-out menu will appear listing the other tools that are grouped in with it. Photoshop's four geometric selection tools are all found in the same spot in the Toolbar. Many of Photoshop's retouching tools are grouped together. Why Do We Need To Customize The Toolbar? 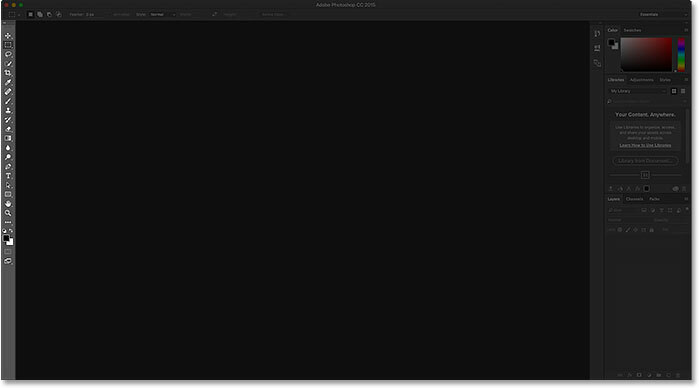 I won't go through every tool in the Toolbar, but obviously, there's a lot of them (66 by my count as of Photoshop CC 2017). It's great that Photoshop gives us so many tools to work with, but you probably won't need every tool every day. There are some tools that you'll use all the time. Others, you'll use left often. And still others that, well, you'll have no use for at all. Wouldn't it be great if we could customize the Toolbar so we could keep just the tools we need and hide the ones we don't? How about being able to change the order of the tools? That way, the tools you use the most could appear first, rather than being scattered all over the place. And what if we could group and ungroup tools in ways that make more sense to us and the way we work? Finally, what if we could save our customized Toolbar layout as a preset that we could switch to whenever we needed? In earlier versions of Photoshop, there was no way to do any of those things. But in Photoshop CC, Adobe finally lets us customize the Toolbar any way we like. Let's see how it works. Going to Edit > Toolbar. Right-clicking (Win) / Control-clicking (Mac) on the Ellipsis icon and choosing Edit Toolbar. The Customize Toolbar dialog box in Photoshop CC. The Move Tool and Artboard Tool share the same spot in the Toolbar. Choosing the Edit Toolbar command. The Customize Toolbar dialog box showing the Move Tool and the Artboard Tool group. Dragging the Artboard Tool from the left column into the right column. The Artboard Tool is now an extra tool, not a main tool in the Toolbar. The Move Tool now sits alone at the top of the Toolbar. So, where did the Artboard Tool go? Well, when I say I've removed it from the Toolbar, that's not really true. We don't actually remove tools completely. Instead, we simply move them from the main Toolbar layout into a new, hidden Extra Tools area. To view the Extra Tools area, right-click (Win) / Control-click (Mac) on the Ellipsis icon in the Toolbar to open the fly-out menu. Or, click and hold on the Ellipsis icon for a moment and the fly-out menu will appear. Extra tools are listed below the Edit Toolbar command. Now that I've moved the Artboard Tool into the Extra Tools area, what if I realize I made a mistake? I actually do use the Artboard Tool quite a bit, so how do I move it back into the main Toolbar? To restore a tool, click on it in the Extra Tools column on the right and drag it back into the Toolbar column on the left. Dragging the Artboard Tool below the Move Tool. The Artboard Tool now sits below and separate from the Move Tool. The Toolbar updates as we make changes. Dragging the Artboard Tool back into the Extra Tools column. Dragging the Artboard Tool into the same group as the Move Tool. The Move Tool and Artboard Tool once again share the same group. If you think about it, the Artboard Tool and the Move Tool really have nothing to do with each other. So why are they part of the same group? It makes more sense for them to be separate, independent tools in the Toolbar. How do I ungroup them? I mean, I could drag the Artboard Tool back into the Extra Tools column and then back into the Toolbar column again as I did a moment ago. But there's an easier way. Dragging the Artboard Tool down and away from the Move Tool. The two tools have been ungrouped. The Rectangular Marquee Tool and the Elliptical Marquee Tool both get plenty of use. But the only time I ever really use the Single Row or Single Column Marquee Tool is when I'm trying to turn a photo into an interesting background. I'd like to keep the Rectangular and Elliptical Marquee Tools in the main Toolbar but move the other two over to the Extra Tools column. Ungrouping the Single Column Marquee Tool. The Single Column Marquee Tool is now separate from the group. Dragging the Single Row Marquee Tool into the Single Column Marquee Tool box. 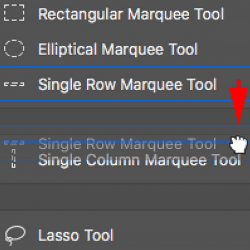 The Single Row and Single Column Marquee Tools now sit inside their own group. The Single Row Marquee Tool is displayed in the Toolbar. The other tool is hiding behind it. How does Photoshop know which tool in the group to display in the Toolbar and which tool(s) to nest behind it? It knows because Photoshop considers the tool at the top of the group to be the default tool. The default tool is the one that gets displayed first. Dragging the Single Column Marquee Tool above the Single Row Marquee Tool in the group. The Single Column Marquee Tool is now the group's default tool. The Single Column Marquee Tool's icon is now displayed in the Toolbar. Highlighting the group by positioning my mouse cursor over its edge. Dragging the entire group into the Extra Tools column. The tools have been moved as a group into the Extra Tools column. The Artboard Tool currently sits near the top. One thing you might want to do when customizing your Toolbar is move the tools you use the most to the top of the Toolbar and move the ones you don't use as often further down. Even though I do use the Artboard Tool, I don't use it enough for it to be taking up a spot near the top. In fact, it probably belongs closer to the bottom, which means I should move it. Dragging the Artboard Tool below the Lasso Tools group. The Artboard Tool has been moved further down the Toolbar. I've moved the Artboard Tool further down the list, but not nearly far enough. I actually want to place it directly above the Hand Tool which is way down near the bottom. This means there's still a whole lot of tools between the spot where the Artboard Tool currently sits and the spot I want to move it to. Using the Extra Tools column to temporarily hold the Artboard Tool. Scrolling down to the Hand Tool in the Toolbar column. Dragging the Artboard Tool above the Hand Tool. The Artboard Tool now sits above the Hand Tool. The Toolbar showing the Artboard Tool's new home. The Crop and Slice Tools are share the same keyboard shortcut. Clicking and dragging the Slice and Slice Select Tools into the Extra Tools column. Tools keep their keyboard shortcuts even when dragged into the Extra Tools column. If you look along the bottom of the Customize Toolbar dialog box, you'll see an option that says Disable Shortcuts for Hidden Toolbar Extras. By default, it's selected (checked). If you no longer want your extra tools to be selectable using their keyboard shortcuts, leave this option checked. That way, only the main tools in the Toolbar will remain selectable from the keyboard. Extra tools will need to be selected directly from the Extra Tools area. The "Disable Shortcuts for Hidden Toolbar Extras" option. Dragging the Add and Delete Anchor Point Tools into the Extra Tools column. Two of the three remaining tools in the group share the same keyboard shortcut. One does not. Selecting the tool to add a keyboard shortcut. Choose the letter from your keyboard, then press Enter (Win) / Return (Mac). Clicking the Clear Tools button. The Clear Tools button makes every tool an extra tool. The Clear Tools feature is a good way to save time when you only need a few tools in the main Toolbar. The additional options at the bottom of the Toolbar. Click the icons along the bottom of the dialog box to show or hide these options in the Toolbar. Clicking the Save Preset button. Naming and saving the preset. And there we have it! That's how to create custom Toolbar layouts using the Customize Toolbar dialog box in Photoshop CC! Now that we know all about the Toolbar, in the next lesson in this series, we'll learn how to manage and work with Photoshop's panels!